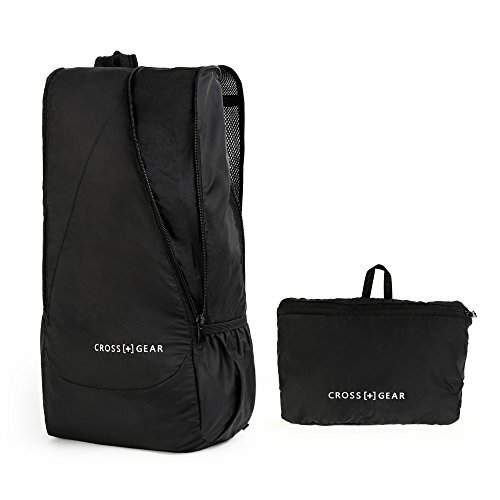 Crossgear was founded in 2013.
it is committed to introducing professional, high-quality and internationally recognized travel gear. Our company has nearly a hundred intellectual property rights and a dozen patents in the case and bag industry. the company is committed to developing into a platform service company in the world's case and bag industry. The backpack is made from highly rip and water resistant nylon fabric, provide strengthen and long-lasting performance with minimal weight. It can Fold into zipped inner pocket to fit anyplace, and unfolds from pocket to backpack in seconds. Size:unfold:10 x 6 x 18 inches fold: 5 x 9 inch :This is a multi-purpose, lightweight, foldable and portable versatile Bag. It can be folded into a small square pouch that is very convenient to carry with. It's suitable for both men and women. Versatile: Ultra-light, Ultra-durable, Ultra-awesome daypack.Perfect for hiking,occasional travel,day-to-day use,pack beach accessories, suitcase alternative, storing diapers,college, camera compartment, camping and more,and great gift for everyone. The backpack is made from highly rip and water resistant nylon fabric, providing strengthen and long-lasting performance with minimal weight. If you have any questions about this product by CrossGear, contact us by completing and submitting the form below. If you are looking for a specif part number, please include it with your message.